3 Publications by "M. Klaric"
C. R. Shyu, M. Klaric, G. J. Scott, A. S. Barb, C. H. Davis, and K. Palaniappan. GeoIRIS: Geospatial information retrieval and indexing system -- Content mining, semantics, modeling, and complex queries. IEEE Trans. Geoscience Remote Sensing, Special issue on Image Information Mining for Earth Observation Data, volume 45, issue 4, pages 839--852, April 2007. This paper presents a framework for the efficient retrieval of satellite imagery from large-scale databases. With the ever-expanding volume of imagery being acquired from satellite platforms it has become increasingly important to locate specific areas of interest within a large database of images. Identifying relevant areas within image databases can be thought of as finding the “needle in the haystack” problem; too often for a particular task or application there exist a small number of useful images hidden among millions of images. The motivation behind the work presented here is that through the use of geospatial image retrieval systems, the number of scenes that image analysts must manually examine may be decreased dramatically. By using a geospatial image retrieval system as a tool, analysts no longer must manually examine the entire database of imagery, but instead can limit their search to a subset identified by our retrieval system. The techniques that are introduced in this paper have been developed in our image retrieval system named GeoIRIS: Geospatial Information Retrieval and Indexing System. M. Klaric, G. Scott, C. Shyu, C. Davis, and K. Palaniappan. A framework for geospatial satellite imagery retrieval systems. IEEE Int. Geoscience and Remote Sensing Symposium, pages 2457--2460, 2006. The differential morphological profile (DMP) can be used for automated extraction of multi-scale urban features, such as buildings, shadows, roads, and other man-made objects. However, characterization of urban features using the DMP is complicated by the fact that some objects will have response at multiple-scales within the DMP. 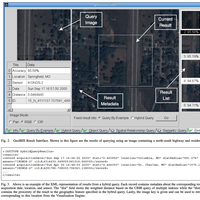 This makes robust and efficient object indexing and retrieval difficult for large-scale remote sensing image databases utilized in the defense and intelligence communities. To address this issue, in this paper we present a novel approach called Multi-scale Extraction of Morphological Objects (MEMO),which is fully automatic and unsupervised. 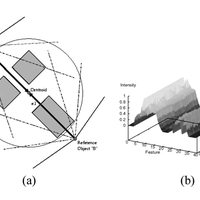 MEMO contains two processing modules for identifying urban objects: (1) Top-down object fusion: multi-scale objects from both morphological closing and opening profiles with certain topological relationships (TR), such as overlap, equal, and inside, will be selected for candidate objects and placed in the candidate pool. (2) Knowledge-based filtering: objects of the DMP are refined and filtered using information present in the original panchromatic image, spectral information of the scene, and the processed DMP. For example, areas of vegetative land cover are filtered out reducing the false labelling of tree clusters and fields candidate objects. Additionally, size and shape analysis of candidate objects can further eliminate possible false object extraction. The efficiency of our algorithm makes it applicable to large-scale object indexing and retrieval. keywords = "gis, data mining, features, machine learning, shape, remote sensing, cbir"
C. R. Shyu, G. Scott, M. Klaric, C. H. Davis, and K. Palaniappan. Automatic object extraction from full differential morphological profile in urban imagery for efficient object indexing and retrievals. 3rd Int. 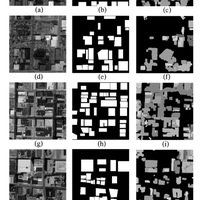 Symposium on Remote Sensing and Data Fusion Over Urban Areas (URBAN 2005), volume 36, issue 8, 2005.